Max Bruch was a German composer who wrote over 200 works, notably his moving Kol nidrei for cello and orchestra, op. 47, and the first of his three violin concertos (Violin Concerto No. 1 in G minor, op. 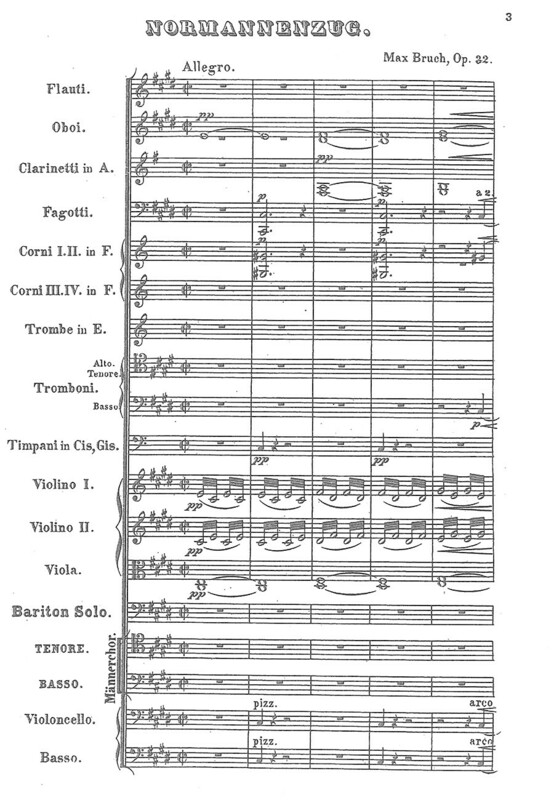 26) (1866), which has become a staple of the violin repertory. Although he was raised Rhenish-Catholic, the National Socialist party banned his music from 1933-1945 due to his name, his well-known setting of a melody from the Jewish Yom Kippur service, and his unpublished Drei Hebräische Gesange for mixed chorus and orchestra (1888). Bruch was also an accomplished teacher of music composition from 1892-1911, conducting seminars and ensembles at the Royal Academy of Arts at Berlin (Königliche Akademie der Künste zu Berlin). British composer Ralph Vaughan Williams studied with Bruch, describing him as a proud and sensitive man. Bruch actively resisted the Lisztian/Wagnerian musical trends of time, and modeled his works on those of Mendelssohn and Schumann. His concerti share structural characteristics with Mendelssohn’s Violin Concerto in E minor (omitting the first movement exposition and linking multiple movements). His most lasting contributions to chamber music include works written for his son Max, who was a clarinetist. Bruch was born in the same decade as Johannes Brahms, Georges Bizet, and four of the Russian Five or “Mighty Handful” (Могучая кучка). At the age of fourteen (1852), he was awarded the Mozart Prize of the Frankfurt-based Mozart Stiftung, which enabled him to study with virtuoso Ferdinand Hiller. In 1858, he moved on to Leipzig and then held posts in Mannheim (1862-1864), Koblenz (1865-1867), and Sondershausen (1867-1870). Beginning in his early twenties, he received commissions for chorus, orchestra, and soprano solo such as Jubilate Amen, op. 3 (1858) and Die Birken und die Erlen, op. 8 (songs of the forest for men’s and women’s choruses with soloists, 1859). Even at this early period, Bruch showed a preference for ancient literary material. Works like Frithjof: Szenen aus der Frithjof-Sage, op. 23 (1864), an oratorio based on a thirteenth-century Icelandic saga which the Swedish poet Esaias Tegner had reworked as an epic poem in 1820, were well-received by audiences. After its premiere in Vienna, one reviewer observed, “Its success can be measured by the deafening applause after each scene, and the recall of the composer three times at the end.” Bruch’s mother praised his harmonies in this period as “straightforward and splendid.” Verbal reports from eyewitnesses and the soloist confirmed that even the orchestra enjoyed the work, featuring a combination Bruch used again in several choral works, ncluding his Normannenzug (hearty male chorus, melodic solos, and an un-Wagnerian view of Valhalla. During the next decade, Bruch went on to compose dozens more such works that were snapped up by amateur and professional choruses. They ranged eclectically across time and nationality for their content, but still emphasized early texts. Examples include Schön Ellen, op. 24 (a ballad by Geibel for Bremen, 1867) and Salamis: Siegesgesang der Griechen, op. 25 (a work for male chorus and soloists by H. Lingg, Breslau, 1868). The highpoint of this period coincided with Bruch accepting a position in Berlin in 1870. Here, he wrote the two women’s cantatas of op. 31 (1870, Die Flucht nach Egypten and Morgenstunde); Normannenzug, op. 32 (setting a balled by J. V. von Scheffel, unison male voices and baritone soloist, 1870); three mass movements, op. 35 (Kyrie, Sanctus, Agnus Dei, 1870) for two soprano soloists and mixed chorus with orchestra; the full-length oratorio Das Lied von der Glocke, op. 45 (after Schiller, 1872), and his greatest success in Berlin, Odysseus: Szenen aus der Odyssee, op. 41 (written for soloists and mixed chorus to a text by W. P. Graff, 1872). He held several prestigious positions, directing the Liverpool Philharmonic (1880-1883) and leading notable concerts in Berlin and northern German cities. He went on an American tour, directed singing societies, and continued to compose for men’s chorus (Kriegsgesang, op. 63 and Leonidas, op. 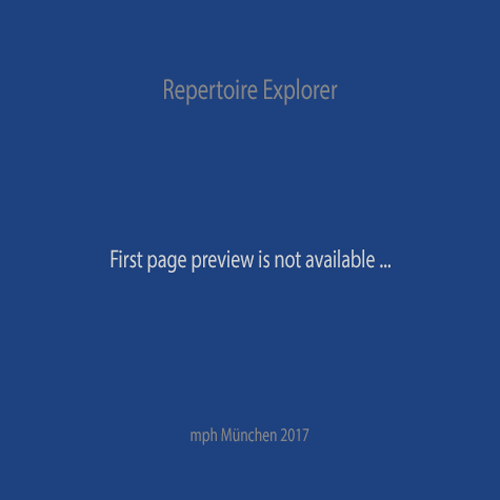 66, 1894-1896) and for mixed chorus (over twenty more works in German dating from the 1870s through his last choral work in 1919 (Trauerfeier für Mignon, op. 93 (after Goethe). The key to understanding the enigma of Bruch’s oeuvre lies in our knowledge of German life in the late Romantic period, a time when Romantic and Classical heroes were held up as metaphors for contemporary successes. English oratorios of the eighteenth-century had preferred Old Testament models to symbolize the strivings and successes of the British populace, but the German Romantics turned to their own contemporary poetry, based in Germanic legends and medieval tales.